Chemical treatment of field fluids in oil and gas installations are vital to efficient and safe operation of the industry. Using the correct production chemicals can prevent corrosion, blockages, and microbial contamination, among other production upsets. Selecting the appropriate dose of production chemicals used to avoid these problems is critical, as incorrectly dosed chemicals can do more harm than good. Having reliable technology to detect the levels of these chemicals is a difficult tasks, as they are often injected at low concentrations into complex field fluids, and the need for analysis to be carried out in remote locations makes traditional analytical techniques impossible. LUX Assure has three products which can help to inform the correct dose of different types of production chemical: CoMicTM, OMMICATM, and TraxBIOTM. 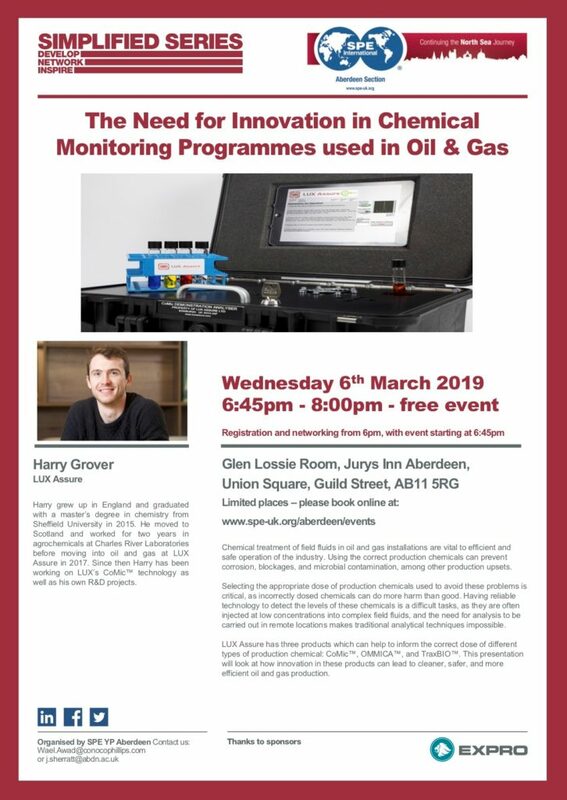 This presentation will look at how innovation in these products can lead to cleaner, safer, and more efficient oil and gas production. Harry grew up in England and graduated with a master’s degree in chemistry from Sheffield University in 2015. He moved to Scotland and worked for two years in agrochemicals at Charles River Laboratories before moving into oil and gas at LUX Assure in 2017. Since then Harry has been working on LUX’s CoMicTM technology as well as his own R&D projects.